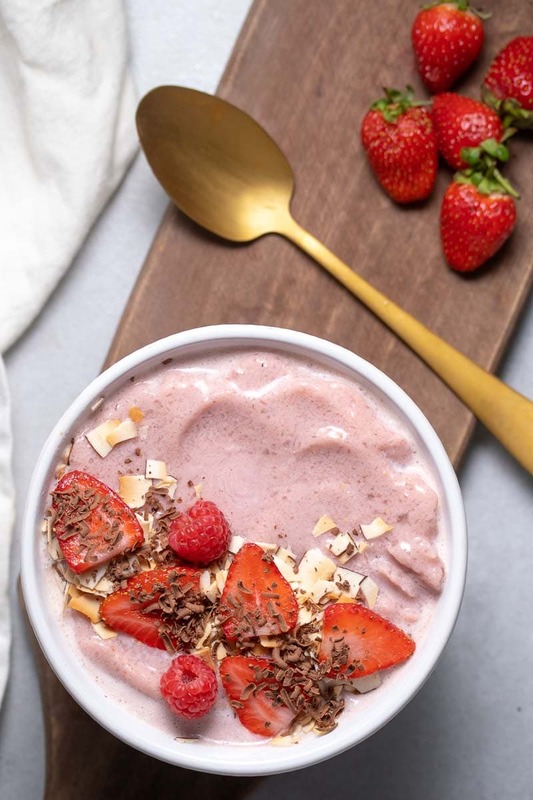 This low-carb smoothie bowl with fresh strawberries is great for a healthy start to your morning. It’s a delicious, creamy breakfast that’s ready in only 5 minutes. Most smoothie bowls use lots of fruits and high carb ingredients, but making a low-carb version isn’t impossible! 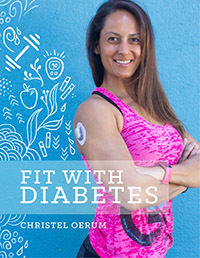 This recipe is 100% diabetes-friendly and tastes absolutely delicious. Best of all, it is ready in just the time it takes to blend the ingredients together (super quickly in other words!). 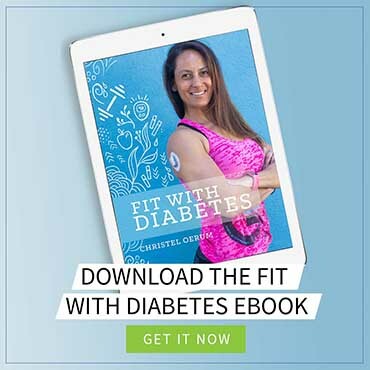 Luckily the thick, creamy texture for this recipe is easily recreated using some low-carb ingredients like almond milk, coconut oil, and crushed ice. They come together to make a rich base, with strawberries giving them a natural sweetness and gorgeous pink hue. The thick and creamy texture for this recipe is easily recreated using low-carb ingredients like almond milk, coconut oil, and crushed ice. They come together to make a rich base, with strawberries giving them a natural sweetness and gorgeous pink hue. Step 1: Put the ice cubes into your blender and leave them to sit for 5 minutes before blending. This will let them melt slightly so that the blender has some traction to blend them into crushed ice. Step 2: Add all of the ingredients to the blender and blend until smooth, creamy, and light pink. Step 3: Spoon immediately into a bowl. Garnish with fresh strawberries, coconut flakes, and cocoa nibs to serve. Using crushed ice is a must for this recipe. If you put solid ice cubes into the blender with all of the other ingredients, they will jump around and take forever to blend completely. It will take a lot of stopping the blender and scraping down the sides. 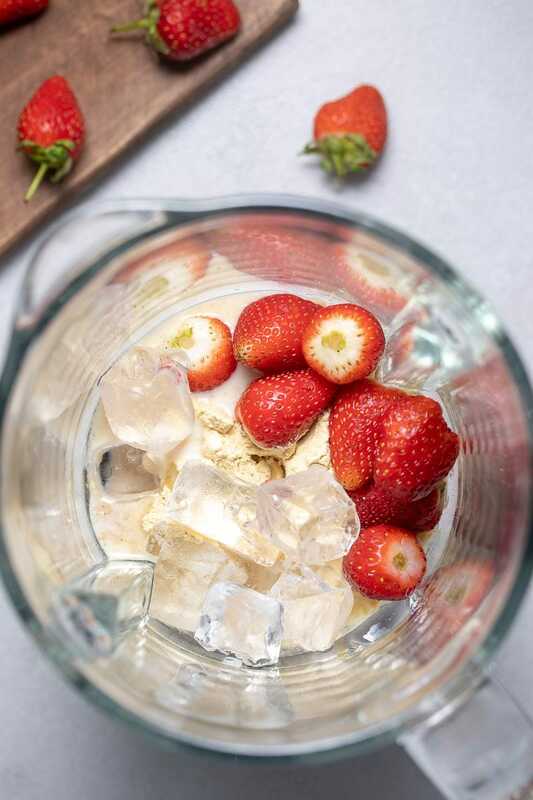 To crush your ice beforehand, use an ice crusher or put the ice cubes into the blender for 5 minutes before blending. You can use any berries or fruit you would like in favor of the strawberries, just keep the amount (2 oz.) the same to keep the consistency right. 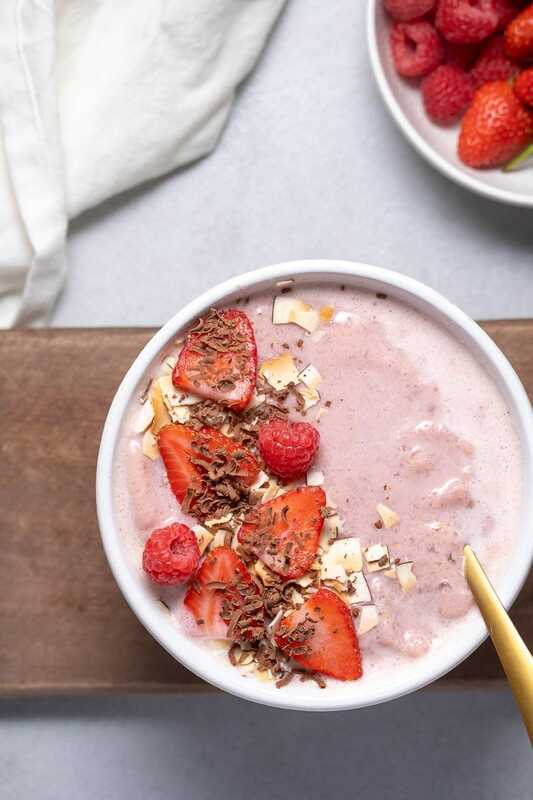 This smoothie bowl is best served immediately. Storing it in the freezer will only yield a lump of ice and the refrigerator will make it melt. You can, however, store all of the fresh ingredients in a sealable freezer bag to make preparation easier. 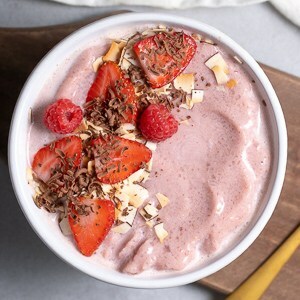 When you’ve made yourself this creamy low-carb smoothie bowl with berries, please don’t forget to let me know how you liked it and rate the recipe in the comments below! 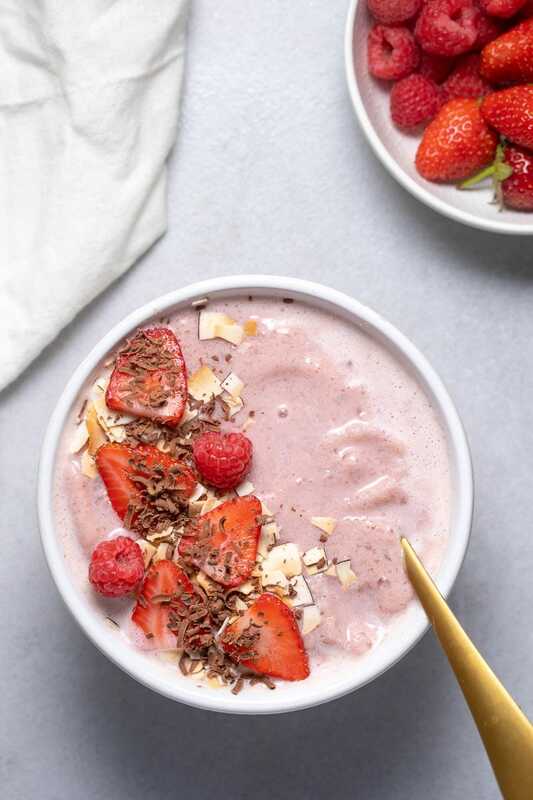 This low-carb smoothie bowl with berries is great for a healthy start to your morning. It's a delicious, creamy breakfast that's ready in only 5 minutes. Put the ice cubes into your blender and leave them to sit for 5 minutes before blending. This will let them melt slightly so that the blender has some traction to blend them into crushed ice. Add the rest of the ingredients to the blender and blend until smooth, creamy, and light pink. Optional: Garnish with fresh strawberries, coconut flakes, and cocoa nibs to serve.